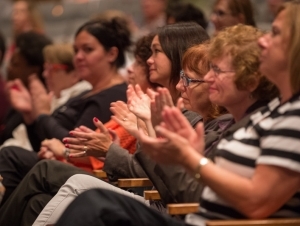 A recognition ceremony to honor faculty and staff accomplishments will be held on Thursday, October 5, at 12:15 p.m. in the Performing Arts Center at Rockwell Hall. 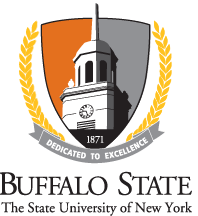 The event will recognize Buffalo State recipients of Chancellor’s and President’s awards. In addition, all new faculty and staff members will be welcomed to campus. The entire campus community is invited to participate in this sixth annual event. A reception will follow in the auditorium lobby of Rockwell Hall. Darlene Sadkowski, secretary 1 in the Academic Commons, is the unofficial office manager of South Wing. She is the first person that visitors to the building encounter, and she greets everyone with a smile and a positive attitude, making them feel welcome. With a wealth of knowledge about the college, she is a go-to resource for information about student services and academic support and advisement. Sadkowski, who keeps calendars for up to 10 academic advisers, reminds both students and advisers about their upcoming appointments, welcomes students for their sessions, schedules future meetings, processes and files all advisee forms, enters data in Blackboard, and ensures that all advisee information is kept confidential. In short, her work greatly strengthens the advisement process, which is critical to student success. Sadkowski answers all calls coming into the busy academic support and academic advisement offices and is the conduit between those offices and the rest of campus. Because many people call “academic support” for any academic-related question, she often must redirect calls. She makes sure that callers are routed to the appropriate department and person the first time for prompt service. Sadkowski also trains, coaches, and supervises several student assistants each semester to help with office tasks. Sadkowski has invested herself in the mission of the college because she cares deeply about students. She deals with situations in a calm, dignified, and professional manner and works collaboratively with all who seek her assistance, including students, faculty, and staff. She is a selfless and dedicated individual who enhances the college with her work. She consistently looks for creative ways to better support student and departmental goals, and her ideas often result in new, more efficient procedures. David Kukulka, professor of engineering technology, has demonstrated outstanding research and scholarship throughout his academic career, and his achievements in the area of thermal science engineering have brought international recognition and prestige to Buffalo State and SUNY. Through his extensive work in the study of fluid properties, heat transfer surface enhancement, and fouling, Kukulka has influenced the next generation of engineers and researchers around the world. For several decades, he has published and presented important and widely cited works, including more than 90 publications in peer-reviewed journals and more than 15 keynote presentations at national and international conferences. He has been an editor for a special issues journal, a reviewer for 12 highly regarded journals, and a contributing member of seven scientific committees. 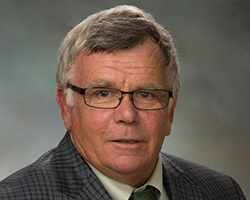 As a teaching professor and coordinator of the mechanical engineering technology program, he has been highly effective in bringing his research and scholarship into the classroom. Passionate, enthusiastic, and extremely knowledgeable about his field, he teaches upper-division undergraduate courses and is responsible for the senior design project course, working closely with students to develop their own research and creativity. 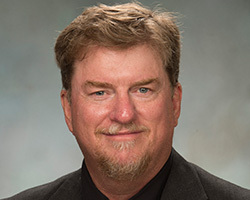 He also supervises the campus’s Baja SAE project, an intercollegiate design competition run by the Society of Automotive Engineers in which students design, analyze, and fabricate small off-road cars under industry guidelines for participation in regional, national, and international competitions. His work is innovative and productive, and his designs are unique and used regularly in industry. All his work is well written and documented. Not satisfied simply working in theory, he demonstrates how to apply research results in industrial practice and how to use data from real-world operations in continuing research. In short, he embodies the professional standards expected of a world-class scholar. During his 45 years at Buffalo State, Thomas Weinberg, professor of sociology, has made contributions to his discipline that his peers consider trailblazing. His impressive body of work in the study of human sexual behavior is highly respected for its quality, originality, and profundity. 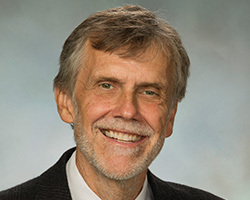 He has established an international reputation as a highly regarded expert in his field. His commitment to scholarship reflects strongly on Buffalo State’s academic mission. Weinberg’s work spans not only the study of sexual behavior but also subfields in the areas of identity, homosexuality, race, and substance abuse. His active and prolific research agenda includes publishing five books, eight book chapters, 13 articles in peer-reviewed journals, numerous reviews, and multiple encyclopedia entries. His writing, which is clear, unpretentious, and accessible, has appeared in both renowned academic journals and popular culture magazines. Weinberg, whose theories are based on observations informed by interviews, has consistently given voice to the circumstances and processes of people on the margins of conventional society and has helped the public understand them as part of a wider system. His innovative and comprehensive studies, focusing on the interplay between public and private issues, have made a significant impact on a field of increasing importance in today’s modern world. In addition to compiling his own research, he is a foundational figure who has positively influenced the lives and work of others. He has encouraged students at Buffalo State and around the world to continue their studies in graduate school. He is widely cited in academic arenas, and his books and articles are used in curricula at institutions around the world. 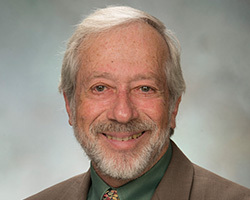 He also has contributed to a more humanitarian and inclusive attitude toward the wide range of sexualities, and his ethical approach and diligence have greatly aided and broadened the counseling profession. Scott Goodman, chair and professor of chemistry, has achieved outstanding accomplishments in leadership and service during his time at Buffalo State. He has willingly met the inherent challenges as a department chair and faculty senator to help the college adapt to new strategies for success. In a student-centric environment, he has used his influence to advance the well-being of both students and faculty. He has served the college on nearly every level, and it is clear that he cares deeply about what happens at Buffalo State and SUNY. He has given extensively and consistently of his time and has both influenced and instigated change at every level of his service. A rigorous teacher and a prolific scholar with an impressive record of publication, Goodman has taught at a number of universities in the United States and abroad and has used his wide range of experience with a diverse population of students to enrich his classrooms. He has also used his experiences to help devise departmental programs and larger college initiatives. As department chair, he has made extensive curricular changes and has influenced and guided budgetary issues, personnel, and graduate studies. He has also worked on numerous college committees, including the high-level Middle States Working Group and College Planning Council. As a valued member of the College Senate, he has worked on the Budget and Staff Allocations Committee, developing a comprehensive understanding of how the budgets of Buffalo State and the SUNY system work. An active, thoughtful, hard-working senator, he insists on clear financial reporting and has helped ensure that budgetary priorities would benefit students, faculty, and staff alike, all for the betterment of the institution. He made sure that his fellow senators were well aware of the financial issues affecting the college. As a SUNY university faculty senator, Goodman has represented Buffalo State with honor and distinction. He has attended every plenary session and presents the positions of Buffalo State with authority. He has earned the respect of his fellow senators, who look to him for his insights and opinions. 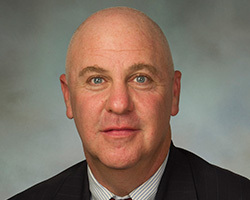 In turn, he has also ably represented the University Faculty Senate (UFS) to the College Senate, distilling the work of the UFS to keep the College Senate apprised of developments at the 63 other SUNY campuses as well as at System Administration. Lori Ann Woods, lecturer in the writing program, is an exceptional teacher who provides her students with rich, invigorating, and meaningful learning experiences. She incorporates a variety of pedagogical methods into her content delivery and readily adapts and changes approaches to meet students’ interests and needs. While Introductory College Writing is not a course that students traditionally seek out, Woods employs strategies that build enthusiasm and accentuate high performance and quality learning. She has embraced teaching writing and excels at it. She is a writer and wants her students to be successful writers who find their voices and express them across the curriculum and beyond. Her student evaluations consistently validate her successful approach. 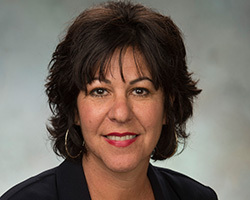 During her time at Buffalo State, she has taken on a prominent role in several of the college’s co-curricular learning activities, encouraging students to connect with the broader community and bigger ideas. She is a valued colleague and leader in the Bengal Community of Scholars Program. She has also developed and incorporated several service-learning activities into her teaching portfolio that provide students with engaging ways to achieve course objectives while meeting an identified community need—and she herself is an active volunteer along with the students. In addition, Woods has collaborated with the college’s Educational Opportunity Program (EOP) and the English as a second language (ESL) program, serving as a tutor and training upper-class students to serve as peer tutors and mentors. Woods’s work exemplifies the transformative power of a SUNY education. She uses her own experiences, including presenting at national and international conferences, to enrich the learning environment of her students. Her superb teaching techniques, command of her discipline, and dedication to holistic growth and development of students is evidenced in every project she undertakes. She is always responsive, always focused on student success, and always encouraging students to cross barriers and grow. Jo Yudess, lecturer in the Center for Studies in Creativity, is an excellent instructor and role model. 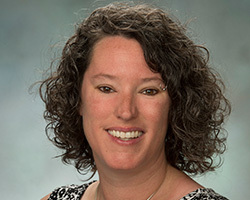 She adeptly applies the concepts and techniques of her primary discipline, creativity, to also teach in the departments of Business, Computer Information Systems, and First-Year Programs, where she creates enriching learning environments that enhance the educational experiences of both undergraduate and graduate students across an array of disciplines. In the classroom, Yudess uses innovative, engaging, and creative ways to enhance the analytical and pedagogical processes. Her approachable, easy-mannered, and collaborative teaching style creates an environment where students are free to test ideas and concepts with confidence and enthusiasm. With a solid reputation, she is a highly sought-after instructor, as evidenced by the number of departments she teaches in and the strong demand for her courses. Her contributions to Buffalo State extend far beyond her teaching assignments as an adjunct. She has taken on several prominent roles in the scholarly pursuits of her department. She supervised a three-year department study that incorporated more than 100 groups and examined the degree to which creativity enhanced the effectiveness of a group’s work on a real-world problem. She also continues to serve as an adviser to numerous undergraduate students engaged in research and co-presents with them at conferences. In addition, she is very active in the areas of service learning and professional development. Her scholarship is widely recognized, and she shares her expertise with many off-campus groups and international audiences. She teaches doctoral-level classes for the University of the Virgin Islands and regularly provides creativity training and consultation in Brazil. These activities provide high visibility for Buffalo State in international arenas. Bruce Fox, university photographer in RITE Services, is an exceptionally talented photographer who has documented the daily stories of Buffalo State with his camera since 2004. His work is used for both teaching and promotional use, and he is particularly adept at capturing the history, expressions, and realism of Buffalo State’s people. Fox’s flexibility, positive attitude, work ethic, and generosity in adjusting his personal life to the college’s schedule are remarkable. He is a great asset to our institution, and his impact has been powerful and far-reaching. Over the years, he has generated a huge online photo repository where the college community can download high-resolution images of their events and activities. The establishment of this photographic database has given Buffalo State a visual identity to be shared across the community. Fox is omnipresent at college events, balancing concurrent events and seamlessly moving from one to another so that he can continually add to this impressive collection of photos. His work is a staple of the college’s advertising, publications, website, and social media efforts. He is also a great mentor to his student assistants. He patiently teaches and supports young photographers and provides them with opportunities to practice their skills. He is eager to learn new technologies and is boldly creative and innovative with his photography—a lesson that he passes on to his students. In 2016, he joined students and organizers from the Anne Frank Project on the annual trip to Rwanda and inspired the college community with a documentary photo exhibition and presentation of his trip upon his return. He is well known on campus for his friendly, enthusiastic, and comforting demeanor, always putting his subjects at ease in order to capture the perfect photo. His service to the college knows no bounds. In addition to his work on campus, Fox volunteers his talents with the Heart Gallery of Western New York to produce its annual photography show depicting children awaiting adoption. The program raises awareness of the number of children seeking a permanent home. Rebecca Tate, lecturer of hospitality and tourism, has been an integral and valued member of the department, where she has served as coordinator of the Statler Program, full-time lecturer, and long-term interim department chair. She has excelled in all her assignments and has maintained a strong willingness to go beyond her duties for the good of the department and the college. As department chair, Tate not only managed the standard operations of the department, such as course scheduling, budgeting, and meeting oversight, but also advanced an exciting agenda for department growth and programming that has benefited both students and faculty. She played a key role in the renovation planning for Caudell Hall, initiated a department-sponsored study-abroad program, and has guided the accreditation process. Tate has also expanded the reputation of the department by partnering with numerous area organizations on unique career programs, including Hotel Henry, the Hyatt Regency Buffalo, and Erie 1 BOCES. She brings her own real-world experience in the hospitality field to the classroom and the curriculum. Her grant-writing efforts have secured funding that has made life-changing international study opportunities available to more than 75 students. Tate is enthusiastic and maintains a positive demeanor that is contagious. Whether working with students, colleagues, or industry partners, she brings optimism to discussions, which is helpful in resolving challenges and considering new ideas and policies. She has a lengthy record of accomplishment, service, and dedication to the college and serves as an important liaison between the campus and the wider community. She exemplifies the college’s mission of student advancement, institutional excellence, and engagement in the community. Jon Lines, lecturer of political science, is an excellent and dedicated teacher and adviser. He has always gone beyond his stated duties as a non-tenure-track employee to help students and colleagues alike, including serving as interim department chair. He has been a willing and innovative faculty member, leading many new initiatives that have improved curriculum and assessment at the college. During his time at Buffalo State, Lines has taught a wide range of rigorous courses in American politics and public law, founded and coordinated the department’s public legal studies concentration and legal studies minor, and brought many professional and networking opportunities to students in the department. His contributions go well beyond sparking an idea and talking about the possibilities of doing something new; instead, he takes action to turn ideas into reality. His advice on curricular matters is always timely and relevant, and his work has been critical to the success of the pre-law programs. Outside the classroom, he founded and advises the college’s competitive and successful Mock Trial team. Through his efforts, the college has hosted a prestigious regional Mock Trial Association competition for the past several years. Because of Lines’s connections in Western New York and beyond, the Mock Trial program and other departmental programs benefit from the attorneys and other professionals in the legal studies field who volunteer to work with Buffalo State students. Lines’s work ethic, commitment to students, and desire to serve his department are formidable, and he balances these with understanding, an extraordinary ability to teach to all levels of learning, and a strong desire to help students outside the classroom as they prepare for careers. His creative and energetic approach to higher education is exemplary. 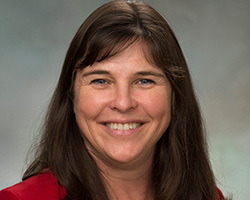 Amy McMillan, associate professor of biology, has demonstrated an outstanding commitment to service within her department and to the college, taking on increasing leadership responsibilities as her career has progressed. As chair of the Buffalo State College Senate, her leadership has been instrumental in advancing the mission of the college, and she has shown remarkable acuity as a teacher, scholar, and mentor. 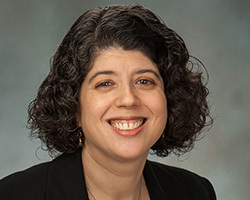 As a faculty member, she has served on more than 20 thesis committees, supervised more than 40 undergraduate research projects, and served on most departmental committees. As a leader of the Senate, she has contributed her expertise and good judgment to campus policies and governance and has demonstrated diligence in this time-consuming and demanding job. She is dedicated to ensuring that ideas brought by constituents and the administration get a fair hearing, and she strikes the right balance between leading and facilitating. She has advanced new perspectives on many important topics, including the college’s strategic plan, online education, applied learning, and community policing. In the community, McMillan assists with many science-related activities, including acting as a science fair judge, presenting research as a visitor to local high school classes, and hosting workshops for the New York State Master Teacher Program. She also represents Buffalo State at numerous SUNY events. In each of her many roles, McMillan has shown diplomacy, selflessness, devotion, and compassion, doing her best to make academic life both serious and enjoyable for students, staff, and her faculty colleagues. She consistently balances the concerns of very different interests and has always done so in a professional, effective, and conscientious way. Jennifer Hunt, associate professor of psychology, is passionate about equality for everyone. Her scholarship, highlighted by 24 publications and more than 90 conference presentations, reflects this passion through its focus on gender and racial stereotyping, including the study of princess culture as well as the effects of race, ethnicity, and culture on jury behavior. As a direct result of her work on campus, students who are deeply committed to studying gender issues are well prepared for graduate studies and career paths related to gender issues. Under Hunt’s leadership, the renamed women and gender studies (WGS) program flourished. Her active recruitment of students increased enrollment from four to 50. She spearheaded a revision of the minor, updating the program to reflect the current state of the field and to expand course offerings, including internships, independent studies, and projects. As part of this revision, the program introduced an interdisciplinary course, Introduction to Women and Gender Studies, that serves as an entry point to the minor and as a popular Intellectual Foundations diversity course. In addition to bolstering the academic side of the program, Hunt has worked to increase campus programming related to gender issues, including hosting speakers for Women’s History Month and developing a WGS book club for students. She also started a brown bag faculty talk series; organized miniconferences featuring faculty, staff, and student research presentations on gender and race; and established an alumni presentation series to connect current students with graduates working in the field. All these efforts have helped add to the inclusive and diverse community on the Buffalo State campus. 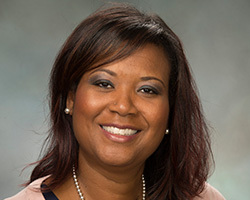 Hunt, who has served on the President’s Council on Equity and Campus Diversity and the Erie County Commission on the Status of Women, epitomizes the college’s value of respect for diversity and individual differences. Buffalo State is a better institution because of her considerable contributions to promoting gender equality and the excellence of her leadership of the WGS program. Hongliang “Jimmy” Xu, professor of mathematics, has demonstrated his excellence as a teacher and a scholar. In his highly productive research work, Xu has shown a consistent ability to quickly progress to the heart of a problem. He is able to discern the mathematical dimensions of new and diverse research problems even if the physical, chemical, or biological context is unfamiliar to him. He develops perceptive insight and acquires the knowledge and understanding of the scientific principles needed to solve the problem. This kind of intellectual aptitude, flexibility, and adaptability defines his success as an applied mathematician. Before joining Buffalo State in 2009, Xu worked with Herbert Hauptman, Nobel laureate in chemistry, as a senior research scientist at the Hauptman-Woodward Medical Research Institute. He concentrated his research on extending the direct methods technique for solving small molecular structures. At Buffalo State, Xu has continued his research in that area by extending direct methods to x-ray powder diffraction crystallography. 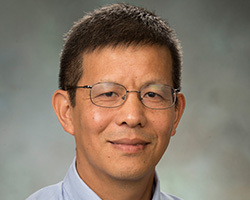 Xu is now considered one of the world’s leading experts on the x-ray crystallographic phase problem and computational crystallography. In addition, he has developed new research in sports analytics. Xu’s scholarly activities include conducting scientific research; mentoring students in their research projects; attending professional conferences, symposiums, and seminars; submitting research grants; and publishing his research findings. He has published 18 articles in refereed journals, participated in eight funded grants (totaling $7.29 million), and made 13 oral presentations at national or international conferences of the highest level in the science of x-ray crystallography. He shares his expertise with students at Buffalo State, mentoring those who are just starting to create their own research agenda. He has mentored six or co-mentored two applied mathematics undergraduate students for their senior research projects. This mentorship has resulted in seven oral presentations at the college’s Student Research and Creativity Conference. In addition, he has mentored six professional and applied computational (PACM) mathematics graduate students for their internship projects and two PACM students for a research project on sports analytics that was submitted to the Journal of Sports Analytics for publication. 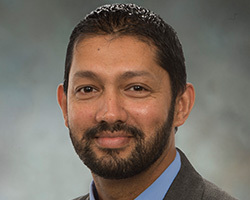 Jude Jayatilleke, senior academic adviser in the Educational Opportunity Program (EOP), continually dedicates himself to community service, committee work, and personal and professional development. In turn, he is equipped to provide superior performance in fulfilling his advisement responsibilities for more than 120 students each year. He is a highly caring individual who provides a thoughtful and attentive attitude toward each of his advisees. Creative, energetic, and sensitive to the needs of first-generation, low-income, and historically underrepresented students, Jayatilleke created and administers the EOP Sophomore Success Program, which has resulted in increased retention of EOP students. He is knowledgeable about international student compliance and regulations and has assisted many international students in their college transition, often assisting them with research and job placement. Adept at event planning, he organizes the annual EOP Honors Convocation and biannual EOP Conference to recognize student achievement and has secured more than $200,000 in grants since 2006 to support programming and professional staff conference expenses. He is skilled at making effective decisions and leading collaborative efforts across campus. Beyond his position in EOP, he has served on numerous campus committees and teaches a popular course on college success to incoming freshmen. His mastery of institutional and departmental regulations, policies, and procedures makes him an invaluable member of the campus community. An active member of United University Professions, he has served as a board member for membership development and as a campus action project leader. Jayatilleke has an extremely positive disposition and a unique way of relating to people from all walks of life. He has the uncanny ability to connect his personal life and observations about the world to the work he does with students. 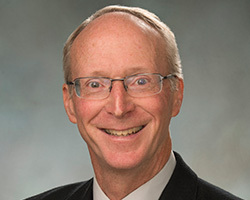 His innate feelings of social connectedness and sense of social responsibility drive his commitment to improving the campus community. Holly Quicksey, director of educational pipeline initiatives in the Center for Excellence in Urban and Rural Education (CEURE), has demonstrated a passion and a talent for working with students, advising and guiding them on the path to academic success. Her proactive, student-centered approach and attention to detail make her extremely effective. She has an exceptional ability to connect with students on a personal level and help them think critically about important issues in their lives, from finances to family to staying on track to graduate. Most important, she takes the time to listen to students and recognizes that each student is unique and has a distinct set of circumstances that affect his or her education. Quicksey has a deep understanding of academics, student affairs, and financial aid. Well informed on these issues, she also works hard to find answers to questions outside her areas of expertise. She has been a leader in University College, CEURE, and the Middle Early College High School program. She has worked collaboratively with the Buffalo Public Schools to help students from Middle Early College chart a path through their high school experience and take courses that allow them to seamlessly transition to Buffalo State. She works behind the scenes to enroll students, monitor their placements, track their progress, and coordinate the team of professionals who assist them. Quicksey is well versed in academic advising. She understands and appreciates the value of quality advisement and its impact on student retention. She has served as a client manager for MAP-Works, the campus’s retention management system, providing training sessions for faculty and staff advisers and providing feedback and tracking for first-year students who may be at risk of leaving the college. As a member of the President’s Council on Equity and Campus Diversity as well as numerous other committees, she advises administrators on recruitment and retention issues, coordinates events to showcase faculty members, and organizes annual student recognition ceremonies. She has shared her research on attention deficit hyperactivity disorder and her experiences in higher education through presentations on and off campus. With a sharp sense of humor, compassion, and sensitivity, Quicksey consistently upholds Buffalo State’s mission to empower students to succeed. Daniel Blum, lecturer of history and social studies education, is an excellent teacher and a well-informed educator who puts students’ needs first. He has a gift for connecting with students at all levels. He is widely known as a detailed, highly colorful classroom presence whose lectures and discussion sessions take students on a wild and wonderful ride through the past. Students consider Blum rigorous yet fair. His classes are creative and fun, and his innovation is demonstrated by the use of props and engaging historical stories to explain ideas. Students are involved in intentional, experiential, and applied learning through various activities that, upon completion, serve as mini-allegories to explain the goals and mission of his class. He sets high expectations for his students, and his overwhelmingly positive end-of-year evaluations show that students respond enthusiastically to his methods. While most of his teaching focuses on introductory-level courses, he is particularly versatile and effective at teaching research and writing seminars for upper-division majors. In addition to teaching, Blum is engaged in scholarship and professional development activities. He has participated and presented at numerous conferences for historians. He is also a longtime participant and presenter at the Pedagogical Institute and is actively involved in instructor meetings, trainings, and retreats for UNC 100: Mastering the Academic Environment, a college success course for incoming first-year students. He is active with cross-disciplinary campus committee work, including the Learning Community Steering Committee and First-Year Experience Committee, and other initiatives that support the activities of teaching and student growth. He fosters a healthful, collegial, and effective work environment and truly believes in Buffalo State and its mission. Most important, he inspires students to reach beyond past limitations and become better students and better individuals. Susan Keller-Mathers, associate professor in the Center for Studies in Creativity, is a consummate educator who matches her extensive teaching experience with heartfelt dedication to her students. She puts great effort into class preparation—constantly refining lesson plans and trying new activities and assignments to deepen student learning—and always adds a dose of reality to the often-theoretical topics she covers in her courses. Keller-Mathers arrived on the Buffalo State campus in 1990 as a gifted and talented teacher at Campus West, where she worked tirelessly for 12 years educating elementary students and supervising and training new educators. In 2001, she transferred her wealth of knowledge to the International Center for Studies in Creativity (CSC), where she has advanced from lecturer to associate professor. During her time with the CSC, she has been the only faculty member to have taught every course in the graduate curriculum. At the center of her scholarship and professional growth is her passion for integrating and supporting creativity in education. 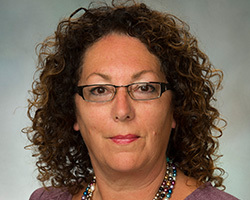 She has a close relationship with education programs at Buffalo State, serving as the creative studies liaison to the educational leadership program and the International Graduate Program for Educators. She also regularly advises independent studies, has developed a new online course, and is co-editing a book on professional development schools with her colleagues in the School of Education. She frequently goes beyond the walls of the classroom to provide opportunities for students to engage in real creative problem-solving facilitation. With the assistance of graduate students, she delivers workshops around Western New York and beyond and has been active with the Western New York Invention Convention. She is a founding member of the Creative Studies Alumni Organization and is an enthusiastic ambassador for both her program and the college. 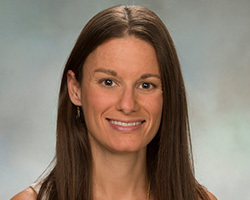 Angela Patti, assistant professor of exceptional education, is a master teacher who actively engages students in learning and truly cares about their success. Dedicated to continually learning and evolving as an educator herself, she serves as an exemplary model for teacher candidates. 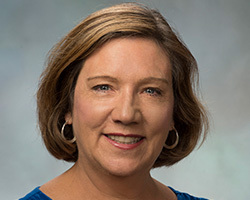 Patti is known to develop strong relationships with her students and advisees and stays connected with many of them in their subsequent academic and professional careers. 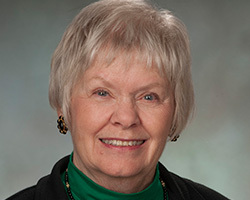 In her time at Buffalo State, Patti has prepared or co-prepared eight education courses and five field experience or student teaching courses. The diversity and number of courses she has prepared or taught demonstrate her deep knowledge of the discipline. Moreover, her participation in a co-teaching pilot shows her willingness to explore new teaching techniques to best meet student needs. She also excels at developing and offering supplemental learning experiences for students. As a leader in the International Professional Development Schools program, she has led two student trips to Chile, delivering life-changing experiences for students. Patti is involved in a variety of professional and scholarly activities. While at Buffalo State, she has published seven articles in peer-reviewed journals and served as a co-editor for a special issue of a peer-reviewed journal on evidence-based practices. She has also delivered 23 professional presentations at the international, national, state, or local level. She has skillfully linked her scholarship to her teaching activities, developing an expertise in co-teaching and implementing powerful international experiences for teacher candidates. She is highly engaged at all levels of service, including chairing college committees, serving the community as an adviser for the pilot expansion of the New York State Master Teacher Program in the area of special education, and volunteering at the Explore & More Children’s Museum’s special program for children with autism and their families, “Au-Some Evenings.” Her passion, professionalism, and tireless devotion to students and colleagues make her an integral member of the department.